Conifers provide a great ultra-low maintenance solution for smaller gardens, rockeries or gravel beds. Provide all year round colour. Includes a mixture of habits and forms. Supplied as a set of 6 different varieties of a seasonally available range. 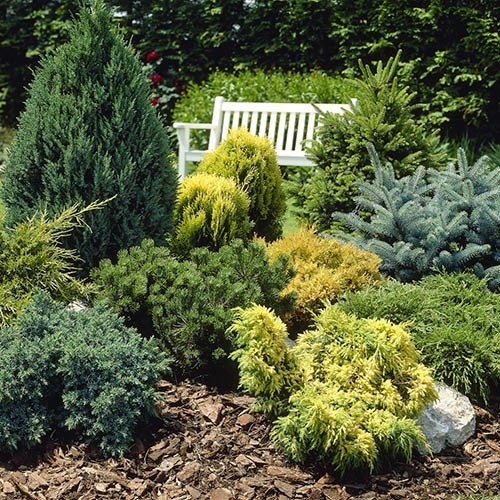 Conifers provide a great ultra-low maintenance solution for smaller gardens, rockeries or gravel beds and this fantastic dwarf varieties mean that anyone can grow them, no matter what size of garden. This collection has been specially selected to provide a complimentary mix of varieties that will provide year round colour. Easy to grow, and fantastic for many a scenario in the garden, you can plant up in pots on the patio as evergreen features that will bring your patio to life at any time of year, or plant directly into the ground to fill up gaps in the garden or separate areas of beds and borders. All are easy to grow and are dwarf varieties so only require infrequent trimming to shape every few years. Best of all, they are very hardy so you needn’t worry about them in the winter – just plant and grow! Supplied as a set of 6 different varieties of a seasonally available range, ready to plant out all year round. Supplied as a set of 6 different varieties of a seasonally available range to plant out all year round.